For the area of Salford, see Pendleton, Greater Manchester. 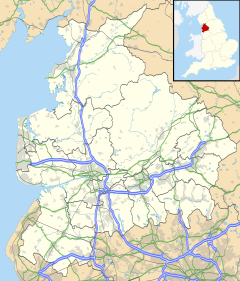 Pendleton is a small village and civil parish in Ribble Valley, within the county of Lancashire, England. It is close to the towns of Whalley and Clitheroe. The parish lies on the north west side of Pendle Hill below the Nick o' Pendle. The village is just off the A59, Liverpool to York main road, since the construction of the Clitheroe By-Pass. Older roads through the parish include one from Clitheroe to Whalley which passes through the Standen area and another to Burnley which passes Pendleton Hall. Pendleton Brook runs down the centre of Main Street in the village. The village pub, the Swan with Two Necks won the Campaign for Real Ale's (CAMRA) national pub of the year award (2013). According to the 2001 census, the parish had a population of 203, however the United Kingdom Census 2011 grouped the parish with Mearley and Worston (2001 pop. 25 and 76), giving a total of 349. The parish adjoins the other Ribble Valley parishes of Clitheroe, Mearley, Sabden, Wiswell, Barrow and Little Mitton. Higher areas of the parish, west of the village are part of the Forest of Bowland Area of Outstanding Natural Beauty (AONB). The brief details of the Blackburnshire hundred in the Domesday survey, mention Pendleton with King Edward holding half a hide of land here. Wymondhouses (an old farm in the south of the parish) was purchased in 1667 by the Nonconformist preacher Thomas Jollie. He had a meeting-place licensed in 1672, later building a chapel that was still in-use until the 1860s. Pendleton also has an interesting history related to traditional folk customs and the witchcraft persecutions. A book was written on this subject entitled The Pendle Witches by William Harrison Ainsworth, published 1849. Doreen McGlashan, born Doreen Wilson, a Pendleton native (now living in Australia, aged 92) states that as a child in the 1920s there was frequent talk of witches and witchcraft in the village, and that she and her siblings were kept indoors on certain Saturdays because of "witches Sabbaths" happening in the town on those days. She also recounts large May Day celebrations in her youth which included dancing around a maypole, and states that as a girl she specifically remembers "pretty girls" often being suspected of witchcraft by the villagers. Most likely all such folk beliefs and witchcraft stories have by now been forgotten or lost by the residents of Pendleton, except perhaps by people who possess family lore dating back to the early 20th century. Pendleton was once a township in the ancient parish of Whalley. This became a civil parish in 1866, forming part of the Clitheroe Rural District from 1894. Parts of the parish transferred to Sabden on its creation in 1904,[a] however the area around Coldcoats was added in 1935. Since 1974 it has formed part of the Borough of Ribble Valley. Along with Wiswell, Barrow (since 2015), Mearley and Worston, the parish forms the Wiswell and Pendleton ward of Ribble Valley Borough Council. All Saints' Church, built in 1847, consecrated in 1872. Swan with Two Necks and Pendleton Brook. Standen Hall, on the western side of the parish near Clitheroe. Well Springs Restaurant and Pendle Ski Club on Clitheroe Road. View from Pendleton Moor, looking north across the Ribble valley. ^ The old township shared a boundary with Read at Sabden Brook. ^ a b "Parish headcount" (PDF). Lancashire County Council. Archived from the original (PDF) on 10 December 2006. Retrieved 27 December 2008. ^ Rebecca Smithers (19 August 2015). "Camra crowns Swan with Two Necks in Lancashire national pub of the year". The Guardian. London. ^ UK Census (2011). "Local Area Report – Pendleton Parish (1170215123)". Nomis. Office for National Statistics. Retrieved 8 February 2018. ^ a b "Wards and parishes map". MARIO. Lancashire County Council. Retrieved 26 February 2018. ^ Forest of Bowland map (Map). forestofbowland.com. Lancashire County Council. ^ "Domesday Book Online". domesdaybook.co.uk. Retrieved 18 August 2015. ^ "Pendleton Tn/CP through time". visionofbritain.org.uk. GB Historical GIS / University of Portsmouth. Retrieved 18 August 2015. ^ "Wiswell and Pendleton". Ordnance Survey Linked Data Platform. Ordnance Survey. Retrieved 26 March 2016. Wikimedia Commons has media related to Pendleton, Lancashire.